LMP has recently appointed a new member of the orchestra. 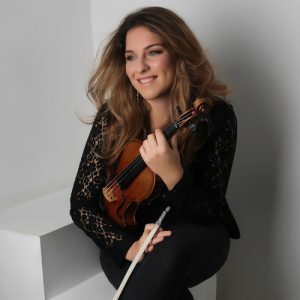 Antonia Kesel will be taking up the no.2 2nd violin position as of January 2019. Antonia graduated from the Royal Academy of Music with a First Class honours degree in 2015. Since then, she has been recipient of the Countess of Munster Award and a Chamber Music Fellow at the Academy. Antonia has won many prizes as a chamber musician with Trio Derazey, including the St Martin-in-the Field’s chamber music competition and the Malta International Music Competition. The Trio released their debut CD ‘Colour of Blossoms’ in 2017 and perform around the UK and Europe. Antonia is also the leader of the piano sextet Phacelia Ensemble and second violin in the Calgary quartet, both of whom perform regularly in the UK and abroad. Antonia gives recitals around the UK and has a violin class at Brunel University. She enjoys a busy freelance career in London working for orchestra’s such as Aurora Orchestra and the London Contemporary Orchestra. She plays on a Francois Fent violin from Paris, circa 1780. Antonia’s first concert performance with the orchestra in her new position will be at QEH on 10th Feb for ‘Elgar, The Dream of Gerontius‘ with Crouch End Festival Chorus.